Durable Global™ Wall Mount Cabinets Are Used For Storage Of Tools, Aerosol Cans, First Aids And Other Miscellaneous Items. Contemporary style and durable steel construction withstand heavy warehouse use, these cabinets fill a variety of needs at an excellent price. Used for storage of tools, aerosol cans, first aids and more. Recessed handles with 2 keys for safety and security. 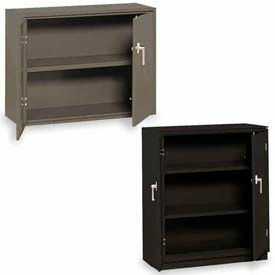 Wall Mount Cabinets feature two 22 gauge steel shelves that are height adjustable at 2" increments. Durable powder coat finish. 36" Wide Global™ Counter Height Cabinets Fill A Variety Of Needs At An Excellent Price. Contemporary style and durable construction withstand heavy warehouse use, these cabinets fill a variety of needs at an excellent price. Made of durable cold rolled steel using 24 gauge steel body reinforced with a 22 gauge steel frame. Reinforced doors include 3-point locking mechanism with a super strong 5/16" round locking bar and nylon guides for silent operation and consistent alignment. Lever handles with 2 keys for safety and security. Counter Height Cabinets feature two 22 gauge steel shelves that are height adjustable at 2" increments. Offers 150 lb. shelf capacity. Durable powder coat finish. Global™ All-Welded 12-Gauge Heavy-Duty Counter Height Cabinets Provide Secure Storage For Machinery, Equipment And Other Industrial Supplies In Tool Rooms, Warehouses, Garages And More. Global 12-Gauge Heavy-Duty Counter High Cabinets are welded from high-strength steel for lasting durability and structural support. Bolt-in cabinet shelves adjust on 2-1/2" centers to accommodate various sized items. Doors swing on 7-gauge leaf hinges to prevent twisting and sagging. 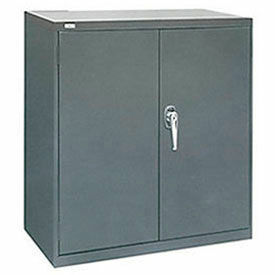 Storage cabinets include three-point cast steel locking handle with 3/8" diameter rods and padlock hasp for maximum security to valuable equipment (padlock not included). Textured powder coat finish provides lasting protection. 36"and 48" Wide cabinets available with 2 shelves. Color finish is Gray. Additional dimensions vary per model. Global™ Clear View Storage Wall Cabinets Helps Organize Your Work Space And Provide Easy Content Visibility. Contemporary style and durable steel construction to meet a variety of needs. Doors feature channel reinforced impact resistant acrylic windows, 3-point locking system with pry-resistant solid steel 5/16" latching rods. Recessed locking handle with 2 keys for safety and security. Box-formed shelves with full width steel channel reinforcement to help prevent shelf deflection.. Tough, scratch-resistant powder coat finish available in Gray and Off White. 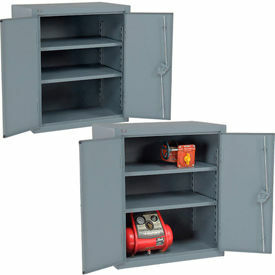 All-Welded Compact And Wall Mount Cabinets Provide Lockable Storage For Valuable Equipment In Residential And Commercial Environments. Compact and Wall Mount Cabinets are made of all-welded steel with chip resistant powder coat finish (some models) for long lasting durability. Three point locking system provides added security. 13-3/4", 16", 18" and 19-7/8" wide cabinets feature single door. 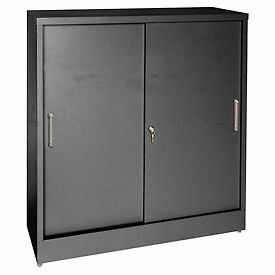 All other storage cabinets include double doors with either one or two handles. Wall mount cabinets lock for secure storage of tools, office supplies and other workplace items. Available colors include Beige, Black, Blue, Charcoal, Dark Gray, Light Gray, Putty, Red, Tan and more. Dimensions vary per model. Desk Height Solid Door All-Welded Cabinets Provide Secure Storage for Warehouses, Offices, Storage Areas and more. Desk Height Solid Door All-Welded Cabinets are made of cold rolled steel using 24 gauge steel body reinforced with a 22 gauge steel frame. Reinforced doors include 3-point locking system with die cast chrome plate locking handle for security. Locking flat bar rods include nylon guides for smooth door operation. 22 gauge steel shelves are height adjustable at 2 -inch increments. Available styles include Wardrobe, Combination, Counter High And Storage Cabinet.Durable powder coat finish. Shelf weight capacity is 150 lb. Available colors include Black, Light Gray, Medium Gray, Putty, Champagne/Putty, and Sand. Dimensions vary per model. 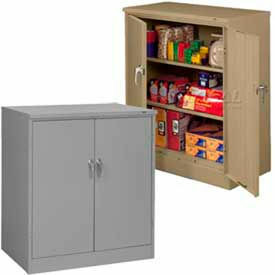 Counter Height Solid Door Cabinets Provide Storage Options For Offices, Garages, Warehouses, and more. These counter height solid door cabinets keep your tools and equipment organized while at home, in the garage, or at the office. The fully welded steel construction is designed to strengthen the cabinet for heavy duty storage. The adjustable shelves can be arranged to hold smaller or larger items for easy organizing. 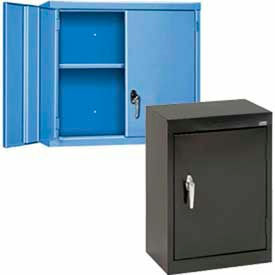 The cabinets have a three point locking system for added security and protection. The full swing double doors give you full cabinet visibility and access. The powder coat finish prevents fingerprint stains or scratches for a high quality appearance. The cabinets can also be placed in unused areas beneath countertops, workbenches, tables, and other areas. Available colors vary per model. 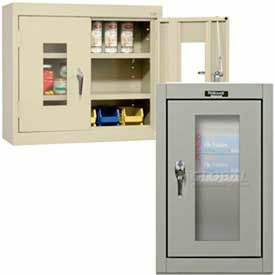 Safety-View Door Wall Mount Storage Cabinets Meet General, Office, School And Residential Storage Requirements. 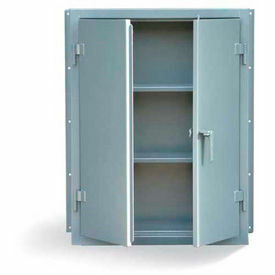 Safety-View Door Wall Mount Storage Cabinets are made of 20 and 22 gauge steel, all welded construction for long lasting durability and dependability. Doors permit viewing of contents through transparent windows. Industrial models designed to meet government requirements. Combines ample storage space for supplies and personal belongings with neat, attractive appearance. 3-point positive locking and chrome plated locking handle with built-in grooved key lock provides security. Shelves adjust on 2 inch centers with triple flanged front for added strength (up to 200 lbs. - uniformly distributed). All-welded frame assembly and factory hung reinforced doors ensure proper operation and fit. Greenguard Children and Schools Certified. Series types are Commercial and Industrial. Color finishes are Gray, Midnight Ebony and Parchment. Capacities are 200 lbs. and 300 lbs.. Shelf capacities are 100 lbs. and 150 lbs.. Dimensions vary per type. Quantity is 1. 2 Year Limited Warranty. 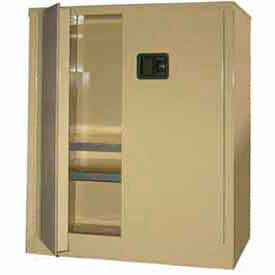 Keyless Electronic Wall Mount Cabinets Provide Secure, Limited Access To Contents While Offering Access Records. These boltless wall cabinets are easy to assemble without the use of tools. Doors include 2-point locking system. Includes shelves are height adjustable at 1-3/4" increments. 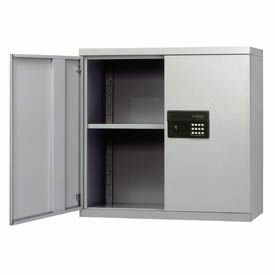 Keyless electronic coded locking handle keeps a record of the day, date and time of when the cabinet is accessed. Coded lock is available with 2 passwords; the administrator and user. Each of the passwords can be reset to any numeric combination up to 8 digits. Exterior battery pack can be plugged into the keypad. Includes an emergency key entry for back-up. Measures 30"W x 12"D x 30"H. Easy assembly. 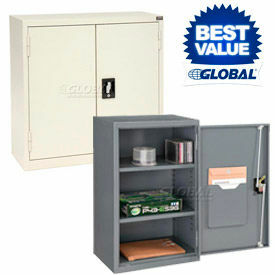 Welded Storage Cabinet with Bottom Drawers Are Used For Office Or Warehouse Storage Needs. Welded Cabinet/Drawers are made of old rolled steel using 24 gauge steel body reinforced with a 22 gauge steel frame and powder coat finish for long lasting durability. Reinforced doors include 3-point locking system with die cast chrome plate locking handles for security. Locking flat bar rods include nylon guides for smooth door operation. 22 gauge steel shelves are height adjustable at 2" increments. 150 lb. shelf capacity 1 Drawer, 2 Shelf Cabinet, Drawer has hanging folder rods, fits letter or legal files, Single key fits both locks. 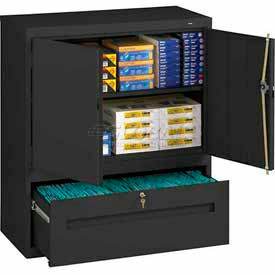 1 Drawer, 2 Shelf Cabinet, Drawer has hanging folder rods, fits letter or legal files, Single key fits both locks. 1 or 3 adjustable shelves. Colors are Light Grey, Black, Medium Grey, Sand and Putty. 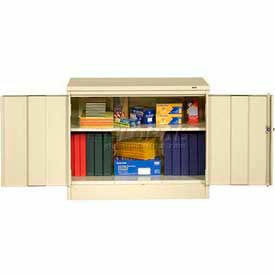 Tennsco 48" Jumbo Storage Cabinets Are Used For Storing Bulk Items Such As Office Supplies, Paper, And More. 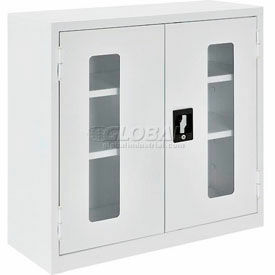 Jumbo Storage Cabinets are made of heavy gauge steel for long lasting durability. 48" wide cabinet provides 13 more cubic feet of storage than a 36" wide cabinet. Engineered shelves utilize box formed construction to accommodate heavy loads, even with extra wide shelf span. Each extra wide door rides on four heavy-duty leaf-hinges for added stability, and three-point locking system provides additional security for stored contents. Integrated levelers keep unit level on uneven floors. Available Unassembled or All-welded. Colors are Light Grey, Black, Medium Grey, Sand and Putty. Equipto Handy Wall And Counter High Storage Cabinets Provide Locked Storage In Workshops, Garages, Offices And Residential Settings. 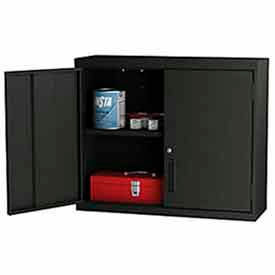 Equipto Handy Wall And Counter High Storage Cabinets are constructed of steel for long lasting durability. Variety of styles available including desk and counter height configurations to fit room specifications. Mounts on wall or sits on other cabinets to store books, manuals or smaller parts. Locking handle mounted in lower half of door. Extra shelves available. Ships unassembled. Available in a variety of widths, depths and heights to meet room space requirements. Colors are Smooth Office Gray, Smooth Reflective White, Textured Black, Textured Cherry Red, Textured Dove Gray, Textured Evergreen, Textured Putty, Textured Regal Blue and Textured Safety Yellow. Weight capacities are 300 lbs, 350 lbs, 400 lbs, 600 lbs and 675 lbs. Package quantity is 1. Limited Lifetime Warranty. Made in USA. Little Giant® Heavy Duty Bench Cabinets Provide A Durable Work Surface And Secure Storage All In One. 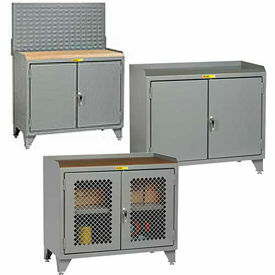 Little Giant® Heavy Duty Bench Cabinets are constructed from all welded steel for long lasting durability. Doors open 180 degrees for full access to contents and include a single handle with 3-point keyed cylinder lock for security. Legs feature leveling feet for uneven surfaces. Widely used in schools and warehouses as well as in commercial and Industrial applications. Depths of 24" and 26". Widths of 18", 24", 36" and 48". Styles and door types vary per model, some include pegboard panels or louvered bin panels. All-Welded Wall Mount and Counter Height Cabinets Keep Supplies Locked Up And Off The Floor For Areas With Minimal Floor Space. Strong Hold® Wall Mount Cabinets are constructed with all-welded 12-gauge steel and powder coat finish for long lasting durability and reliability. Cabinets feature two adjustable shelves for versatile storage options. Available shelf capacity is 1900 lbs. Color finish is Dark Gray. Includes 1 year limited warranty. 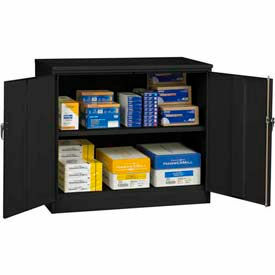 ALB PLUS Welded Storage Cabinets store workplace supplies in your office or shop, and are built with heavy gauge steel for years of reliable service. Cabinets include 2 adjustable shelves to hold a variety of office, commercial or industrial supplies. Shelf capacities available are 125 lbs. or 300 lbs. Doors swing open fully for complete access. Colour finishes are Light Gray, Black, Charcoal, or Beige. Dimensions vary per model. ALB Plus Wall-Hung Storage Cabinets Increase Storage Capacity In Industrial, Commercial Or Office Areas Where Floor Space Is Limited. 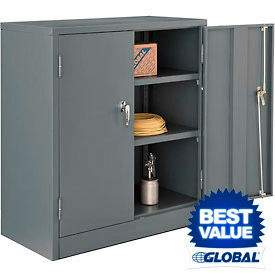 ALB Plus Wall-Hung Storage Cabinets are manufactured from steel for lasting durability and strength. Wall-mount cabinet includes one adjustable shelf to hold up to 100 lbs. of workplace tools or supplies. Recessed handle provides a comfortable grip and cylinder lock secures stored contents. 36"Wx12"Dx30"H cabinet is available in Beige, Black, Charcoal and Light Grey colour finish.